Before work this morning, I watched a complete stranger brush his teeth. If that sounds weird, there were actually nine other people watching too. The twist is that this particular person was located somewhere in the US and all nine of us were all able to send him our comments. When that got boring, I joined another man on his morning jog. I found out he lives in Boston and it’s still pretty cold outside. The man often turned his phone around and replied to our comments about the weather as we all watched his live broadcast. I am really bored? Have I run out of meaningful things to do with my time? I hope not! All this was made possible by Twitter’s brand new app called Periscope. 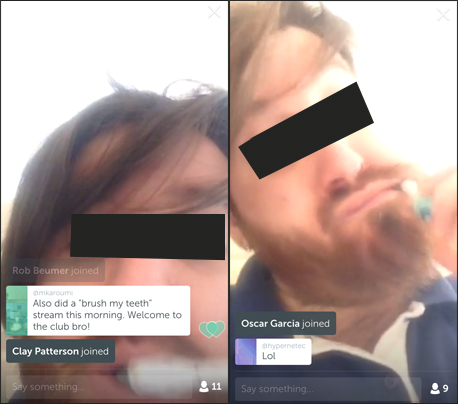 Periscope allows anyone to setup a “live stream” through their mobile device. If the live broadcast is set to public, anyone is free to join and add their comments. As the video is live (with almost zero lag) the person in the video can respond to text comments as if you were there with them. Admittedly, at first it felt a little eerie and perhaps even a little voyeuristic, but it also made the connection to these people feel more “real” and immediate. Interview someone (i.e. another teacher in the school) and get the students to ask questions in real time. Broadcast parts of a class outing or field trip. Students at the school can participate. A language student could do a private broadcast of what she sees on a simple outing outside of the classroom while the class asks questions and interacts with her. This could be a neat activity for a Literacy or FSL classroom. Regularly scheduled interactive tutoring sessions for a group of students. Connect up with another classroom in another part of the world. Students on both ends would need to focus on how to write clearly worded questions. The bad: Privacy and safety concerns about public broadcasts, asking students to create personal accounts, potential for inappropriate use, especially with young or less mature students. Teachers may want to avoid doing private 1-to-1 broadcasts with individual students. Overall, this is somewhat uncharted territory (the app was just released earlier today) so proceed with caution before you jump in. The good: You don’t need fancy hardware or software, only a smartphone and an Internet connection. It just takes a few seconds to get up and running. It’s easy for anyone to interact with your broadcast. You can also create private streams (i.e. – broadcast to specific people) so that random strangers can’t join your classroom broadcast. You can also disable your specific “geolocation” when broadcasting. If students start showing interest in doing their own broadcasts, this could be a perfect opportunity to teach students about the pitfalls of sharing too much personal information online, i.e. – teaching Digital Citizenship. So that’s that for now. If you have an idea of how live broadcasts could be used in your classroom, please contact me or share a comment below. Last but not least, there’s an article about Periscope on Wired if you’d like to know more about the tool before trying it out yourself. This entry was posted in Aha Moments! and tagged broadcast, live broadcast, live stream, periscope. Bookmark the permalink.